For decades critics of the oil industry have argued that the industry has a latent disregard for the safety of its workers and the communities in which it operates. The spectacular disasters we have witnessed over the years – from Piper Alpha, to Exxon Valdez and Deepwater Horizon – often hide the routine spills and accidents that never make the news. But now we have a new threat to communities across North America and that comes from crude-by-rail trains. In the last month we have witnessed a spate of accidents that has given a new urgency to the debate over the safety of moving millions of tonnes of volatile crude around North America’s creaking rail network. You would have thought that the oil industry would be reacting fast to the deteriorating safety situation by doing everything in its power to reassure communities from the barren Bakken shale fields to the affluent coastal communities that America’s railways are safe. But you would be wrong. Despite the spate of recent accidents, the oil industry is lobbying against further safety measures. The build-up of high vapor pressure has been identified as a possible factor in explosions in the recent crude-by-rail train derailments in Illinois and West Virginia. Tomorrow is the deadline for new regulations to cap vapor pressure in Bakken crude oil transported by rail. Many experts are warning that the new rules are actually inadequate as they fail to take into consideration how Bakken crude behaves in transit, as gas levels can increase during transportation. This raises “doubts about whether the state’s much-anticipated rules will make oil train shipments safer”, argues Reuters. Indeed, checks have found that vapor pressure can increase from 9 psi to over 30 psi during transit, over twice the new limit. The US National Transportation Safety Board, under pressure to make crude-by-rail shipments safer after a string of accidents, is also calling for a federal standard for “setting vapor pressure thresholds”. However, the main oil industry lobby group, the American Petroleum Institute (API), is lobbying against new standards. 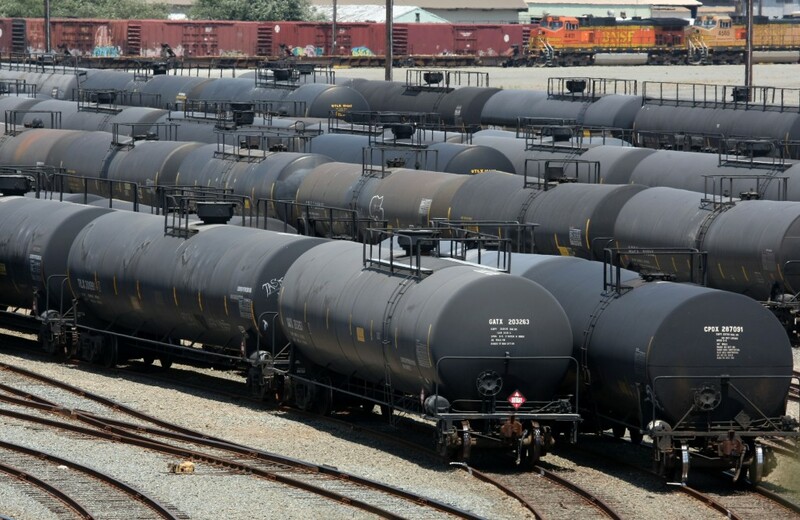 Reuters reports how the API “is lobbying lawmakers to resist federal vapor pressure benchmarks and last week urged lawmakers to oppose ‘a national volatility standard.’” The API is arguing that this would add unnecessary expense to carrying crude by rail. What this shows is that once again the oil industry is putting profits before people, and showing a deeply callous disregard for the safety of communities across North America who are close to railways. And although we would expect the industry to be sociopathic, as it always has been and always will be, it also seems that the regulator is incapable of making crude by rail safe too. So that is why we need a moratorium as soon as possible, before we have another accident. Bit one sided a Andy? What’s your solution, sunlight, pixie dust and regulators? The answer is density. Reduce human density and most of the problems go away. Try to fix it through massive government and regulation and the problems will simply grow as will the misery and poverty and human spiritual bankruptcy. See history 101 and note the provisions in Agenda 21. Further, you should reference the history of big government social justice. It’s replete with success. Or if you’re short on time and don’t really have the energy for all that thinkin, just pick up a copy of animal farm by George Orwell. Note the pigs. Or if audio is your thing Temples of Syrinx by Rush ( 2112 side A ), or Sparks of the tempest by Kansas. Censorship too… Wow surprise surprise surprise! College campus in America are the home of socialist and communist thought. These are places where educators have tenure so that they can speak without fear of reprisal yet many colleges have instituted free speech zones in an effort to limit the exploration of ideas contrary to the left wing whack job stuff they are teaching kids. Freedom is always the first to go whenever the leftys show up. I don’t know why we aren’t shipping bitumen in a solid form. CanaPux is one example. They don’t explode and they float.